Head straight for couscous and tagines at this Finsbury Park Moroccan caff, and polish off your meal with tea and pastries. It’s tough finding a tagine for under a tenner in this town. But at Le Rif, only one dish on the extensive menu costs more than £5. This Finsbury Park eaterie isn’t remotely atmospheric, although there’s much to be said for a North African restaurant free of Arabic cliches. Instead, it caters to a local lunchtime crowd, many of whom eschew the North African offerings for sandwiches, jacket potatoes and spaghetti bolognaise. While such options seem bland compared to the Moroccan dishes the friendly owner can speedily conjure up, the starters were nothing special: a mild lentil, chickpea and rice soup; and houmous with olives and flatbread. The mains were excellent, though. With a combination of spinach, olives, potato, aubergine and lemon, the fish tagine got that balance of sweet and savoury flavours absolutely correct. 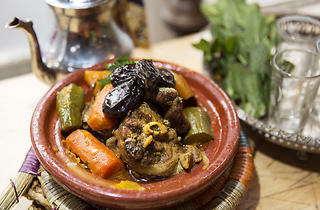 Couscous royale was every bit as successful, with tender, succulent chunks of chicken and lamb in a subtly spicy broth. There’s only one way to end a great Moroccan meal – with pastries and a cup of fresh mint tea – although it does feel a little surreal to pour tea from a beautiful brass pot in a Finsbury Park caff. One of my favourite North London cafes. Excellent service, amazing value & delicious food & Moroccan tea. Vegetarian tagine is just £4 and is a huge amount of food. The owners are very friendly and they have free wifi. As a moroccan I can honestly recommend this place. The food is authentic and the owner is extremely welcoming and kind, and the food is very affordable! A little piece of Morocco in the middle of London. Had a huge beef tagine with spinach, washed down with mint tea. Perfect end to a day at the panto. Love this place, great authentic Moroccan food with warm friendly service. Great selection of fresh dishes and lots of choices for vegetarians. They are always really friendly and I love their hot sauce! The value for money here is astounding - the Tajines are varied and tasty and you can combine them any way you like, all for around a fiver a pop. It's a little miracle on Seven Sisters Road. Great food and cheap. Always reliable. Amazing food ,lovely staff . Excellent food at very reasonable prices and friendly service, glad we gave them on our doorstep! Very tasty, inexpensive food in a no frills North African caf. Always a great choice, fish, meats and veggie dishes, choices fully explained, though I can never go past the chicken and olive targine if on offer! Le Rif is an absolute gem of a cafe. It doesn't look like much, except perhaps a slightly run down cafe, but its probably one of my favourite places in the area. First up, the owners are really lovely. Happy to discuss their menu, bring you the food/drink etc and just generally have a chat. Secondly, the food is fantastic. For about £5/6 you can get a beef/lamb tagine that is HUGE, and is packed full of flavour. 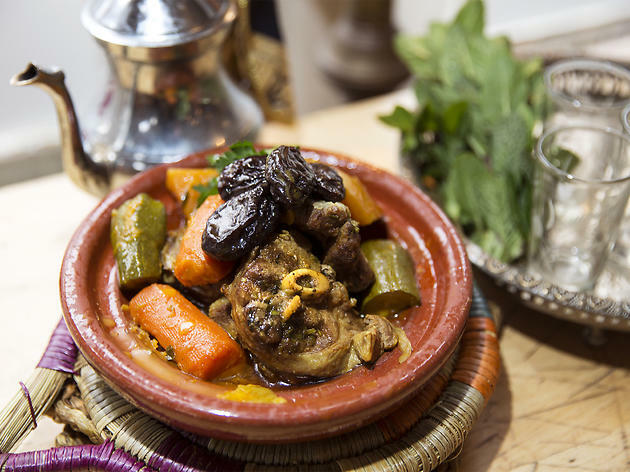 Served on either a bed of rice or couscous, they precook all the stews so that it's served fast to your plate. Don't worry if someone complains about it being microwaved, it's just incredibly good, honest and wonderful food that will nourish your stomach and soul. Top it off with a fresh pot of mint tea and it's brilliant! On a side note, on match days, a lot of the locals come to the cafe to sit and watch the game. They don't serve alcohol etc, but it's clear the cafe is a bit of a central hub which is great! No frills here but the the food is consistently delicious and for the portions you get it's very reasonably priced. You just can't argue with a tagine for £5-6. I'm in there at least once a once for takeaway. I'm a huge fan of this place. Luckily I live within a 15 min walk. The £5.50 chicken beef or lamb tagine are all great. Unpretentious & seemingly friendly to all ethnicities and customer types. You should definitely give this place a try! Cash only.